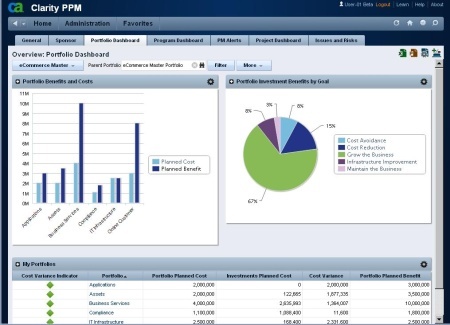 The potential audience for PPM software has expanded in the past fewyears, said Kelly Blice, a CA Technologies vice president ofmarketing for portfolio management software and services. Clarity 13 is the first update tothe product line since 2010. Originally, IT departments used the software to manage theirIT projects. PPM software can be used to keeptrack of the work hours spent on a project, to summarize how far alongthe project is toward completion, to alert managers about impendingdeadlines, and to get an estimate of how much money is being expendedon a project. Now the software has found a second home in manyorganizations’ project management offices, where it can be used towatch over non-IT business projects as well. To this end, in Clarity 13, CA Technologies has re-engineered the Webuser interface of its software in hopes of making it easier for non-ITbusiness managers and analysts to use. The idea is to allow users toget to the data more quickly than they could using previous versions,Blice said. In particular, the software allows users to create their own dashboardsvia a drag-and-drop interface, which allows them to highlight the datathey are most interested in following. The menus have also beenstreamlined so that users can get to information more easily, throughtwo clicks rather than 10 or 11 clicks that the previous version oftenrequired, Blice said. The built-in charting capability has been streamlined as well. It nowcan present information as a Gantt Chart, a type of bar chart used forshowing how far along a project is to completion. It can also presentproject milestones in graphical form, as a visual roadmap. In addition to a revamped user interface, the software is nowintegrated with Salesforce.com‘s Chatter hostedcollaboration space, which allows participants to search for otherexperts in the organization, to collaborate on documents and to followitems of interest, such as ideas, requirements and tasks, from theirdesktops and cell phones. Clarity 13 is the first major update of the software since Clarity 12,released in 2010. It is available as both software and as a hostedservice from CA Technologies itself. The price of the on-premiseversion starts at US$125,000, for 100 users. Additional users can beadded on a per-seat price. The CA Clarity PPM On Demand service startsat $50,000 per year, for 100 users. Additional users can be added on aper-seat basis.